The colors have come alive with magic this weekend in Northern Minnesota reminding me of all the fall weekend trips I did as a child up north. It was a family tradition that was so special that I’ve continued it with my own children. 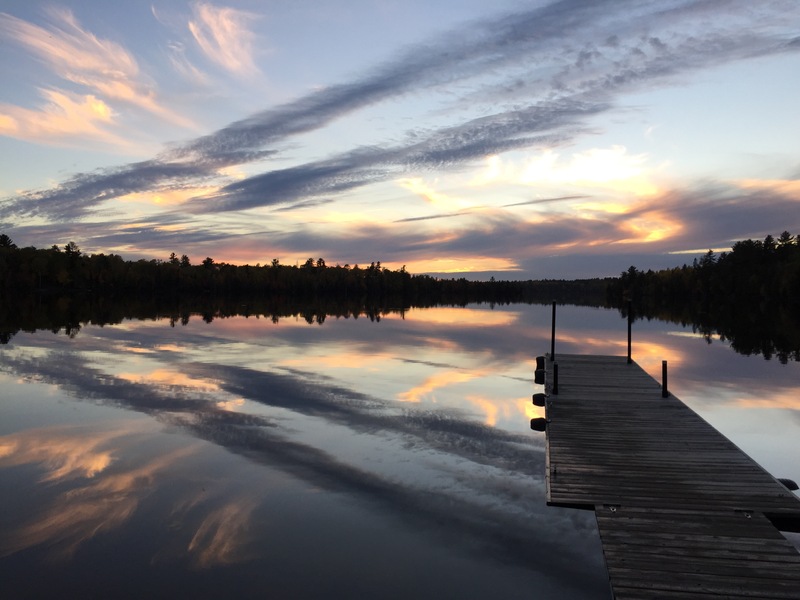 This weekend we drove about five hours north of Minneapolis to Ely, one of the launching off points to the Boundary Waters Wilderness and Canoe Area. The pristine air, lakes and forests is breathtaking and reminds me so much of my youth growing up in Minnesota. Fall is the time of year I feel so alive with energy as the light graces the changing colors of the leaves and the deep blue sky is vibrant and pure. The fresh scent of the air or even the smoke of a campfire fills me with warmth and nostalgia. Here are a few photos from our weekend up north. Many more will come soon. It is way too beautiful here not to share. My daughter and I went paddling to the beaver dam at the end of the lake. It was so incredibly serene. All we heard was the sound of the birds. And the sunsets were mesmerizing. This post was inspired by the Weekly Photo Challenge: Nostalgic. It’s amazing how much more the leaves have changed color way up there! I’m back in Chicago for the weekend and everything is still green here (and, of course, in DC nothing has turned yet). But I do feel fall is on its way in the air and, like you, feel nostalgic for the autumns of my own youth. Glad you had a great time in that beautiful setting. Yes our leaves in Minneapolis are just starting too which is late. The peak is usually the first weekend in August. There were even some areas way up north that hardly had changed! Crazy. But so beautiful!!! Yes it has been a while since we last spoke, how are things? When I came back from Philadelphia last weekend, the tree in Pennsylvania were just starting to change, just barely. As mentioned above, the Chicago area is still hanging on to the green of summer, while giving us fall temperatures, which is a great combination for me, although I love fall, too. Beautiful gallery you shared. Yes we are pretty green here too in Minneapolis which is so late. The leaves are just starting. It is amazing how five hours north how much more the leaves have turned yet there were a few lakes we hiked around and the leaves had hardly started which was strange. It is so incredibly beautiful in northern MN! Thanks for stopping by Janet! Thanks so much! Our leaves here in Minneapolis are just starting to turn and only five hours north on the border of Canada where I took these photos, the leaves are at their peak. Can’t wait to get fall here! Absolutely gorgeous. It makes me nostalgic for the fall season. Thanks Debbie! I sure do love Fall! Simply beautiful! We’re headed up the N. Shore of Superior to the Lutsen/Grand Marais areas next weekend… hoping to catch the fall colors as we hike the SHT. You definitely hit the colors near Ely! Great shots! Thanks Mike! It was stunning up there. Just magical. The weather was incredible. I had to pinch myself several times. Have fun up north! Loved the photos here and on IG Nicole. Stunning catures worthy of postcards. Thanks so much Sue! It was so beautiful! All these were taken on my cellphone too. I haven’t even downloaded them off my camera yet but I can hardly wait. It was surreal up there! Beautiful post..Indeed these fall colors make the scenery beautiful! Thanks so much! I LOVE fall! Beautiful! Here in Lower Alabama, we don’t see this. Thanks for sharing! It makes our long winters worth it! Fall is my favorite time of year! Thanks! Ely isn’t too far from the Canadian border so I’m sure it makes you nostalgic! I sure love fall! All of your photos are incredible this week, but the first one is my favorite. The color of the sky, the clouds, the reflections in the water and the lush fall leaves create a desire in me to be there and see it for myself. Well done! Thank you so much! That first photo was taken in the morning. The light had just come out from the clouds and if I didn’t run out to snap the photo I would have missed it. thanks so much!!! Thanks Andrew! It was incredibly beautiful up north! Your photos were absolutely beautiful! Thank you so much! So glad you enjoyed them Gale! Gorgeous! I dream of doing a lengthy kayak trip on those boundary waters someday. Yes it is so amazing up north LuAnn. So pristine! Yes, that color is just so beautiful. I love fall!!! It is just that our winters are so long.